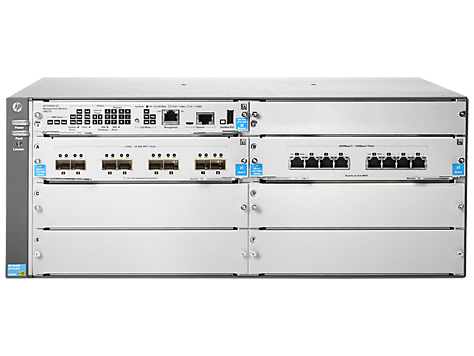 The HP 5400R zl2 Switch Series is the next-generation modular switch designed for enterprise edge and SMB and branch office core deployments. With enterprise-class resiliency and unprecedented flexibility, scalability and ease of use, the 5400R supports demanding network features such as hitless failover, power supply redundancy, QoS and security with full L3 features. Robust virtualization with HP AllianceOne solutions and flexible connectivity including 10 Gigabit Ethernet and full PoE+, the 5400R requires no add-on software licensing and is SDN ready with OpenFlow support. • The HP 5400R zl2 Switch Series provides enterprise-class resiliency and unprecedented flexibility, scalability and ease of use for enterprise edge, and SMB and branch office core deployments. • The HP 5400R zl2 Switch Series uses the 5th generation HP Networking ASIC and delivers wire-speed classification and policy enforcement. This hardware-based control of access and traffic allows protection, detection and response to network threats with no network performance degradation. 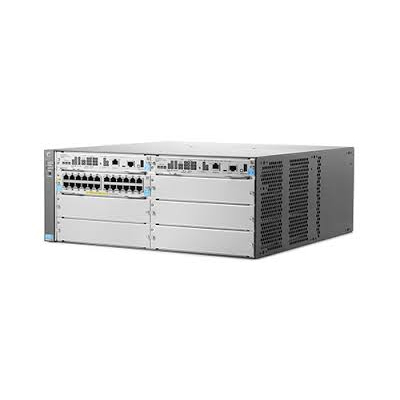 • The HP 5400R zl2 Switch Series includes a robust set of security and quality of services features to build a secure network that meets ever-changing corporate policies and compliances. • The HP 5400R zl2 Switch Series can be seamlessly managed with HP Intelligent Management Center (IMC) to provide end-to-end network transparency with consistent network experience through comprehensive configuration, compliance and policy management.